This 1,186-word blog post was written by Verblio writer Sarah B. who has moved, in her professional career, from writing prescriptions for medications to writing prescriptions for healthy food. The food system in America faces a number of variables that challenge efforts at sustainability. Sarah is working on a business plan for an urban hydroponic farm that will meet goals for sustainable use of water and energy, will maintain a net-zero carbon footprint, and will bring hyper-local fresh greens to the local market. 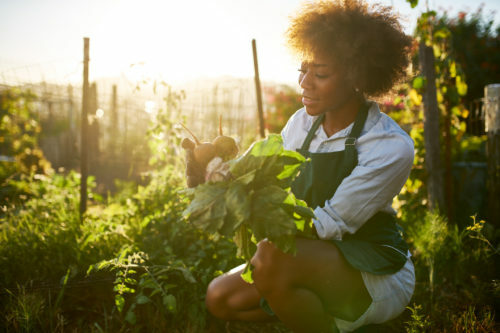 Local food system support networks across America are helping new urban farmers and food producers re-image healthy, fresh, affordable food for local communities. These support systems are using principles of sustainable development for education programs, business development, and community hunger initiatives. This type of content can be used as educational awareness pieces for sustainable businesses or nonprofits to contribute to their overall marketing strategy. What are the UN’s Sustainability Goals? The UN developed goals in 2015 for sustainable development around the globe. Goalkeepers are working on developing and assessing progress in the seventeen goal areas. These goals address poverty, gender equality, hunger and health, education and clean energy, access to clean water, and healthy environments on land and at sea, among other areas of hoped-for sustainable development. Many new businesses, when developing plans, strategic goals, and company values, hope that their contribution to commerce can impact these sustainability goals. When we think of sustainability in business, it is with an understanding that all costs catch up eventually. A short-term economic savings will come due eventually, in ways we may not expect. When developing a sustainable business, we look at all of the costs, long term, short term, to the environment, to the supply chain and workers, and find ways for balance and profit. When sustainability is the backbone of an enterprise, all decisions and plans are filtered through that lens. What is sustainability within the food system? The current American food system is facing sustainability challenges in many areas. Estimates of fossil fuel energy use for food production and shipping suggest we are using 10 Kcal of energy to produce 1 Kcal of food nutrition. Food is being transported over long distances, impacting the energy cost, carbon footprint, and other environmental impacts such as air quality. Biodiversity is impacted as varieties that can be picked green, and shipped over long distances, are being selected by growers. This lack of biodiversity also impacts pesticide and fertilizer use. Food waste is a growing problem, with about half of the fresh food produced in America ending up in landfills. We throw away three times as much food packaging as food. Food processing systems are being blamed for an increasing number of outbreaks of deadly food-borne illness, and agricultural workers and farmers face dangerous working conditions and extreme poverty. And within these challenges, the specter of food insecurity and hunger among vulnerable Americans continues. Food deserts plague inner cities. Our current grocery stores are designed for driving. How will we access healthy fresh food when we can no longer drive? In the past, Americans had more options for local food, from their own Victory Gardens to summer canning to a freezer full of local zucchini, traded for fresh tomatoes from a neighbor. Developing those healthy, local food systems again, and finding new ways to feed ourselves and our neighbors, is the goal of many sustainable food businesses. Many people who develop plans for a new food business hope to find the balance between profit and purpose. While it is difficult to work within a framework that will impact all of the sustainability challenges within the current food system, much early planning can incorporate the impacts suggested by B Corp businesses. This model for sustainability in business requires businesses to consider the impact of their decisions on workers, consumers, those in the supply chain, the community, and the environment. This metric will quickly allow problem areas to be isolated and resolved in the early stages of planning. As plans develop, many new businesses focus in on one area of primary concern. The development of hyper-local and local food systems in many communities gives us a blueprint for planning in areas such as transportation, packaging, and local markets. The new hydroponic urban farm, Living Lettuce, is addressing several challenges with a business model that specifically focuses on current system challenges and B Corp planning paradigms. Concern over lettuce that travels over 2,000 miles to the plate, and must be stored for four weeks or more, informed first investigations into methods for growing local lettuce year-round. Hydroponics suggests a massive water savings, from about 25 gallons of fresh water per head produced by current methods to under 1 gallon using aeroponic systems. Hydroponic or aeroponic systems also allow the lettuce to continue growing until picked same day for market, and keeping roots intact protects the nutrients. Modern lighting systems, such as LED lights, allow year-round, indoor growing for a considerable energy cost-savings. The Living Lettuce model also plans to develop a net-zero carbon footprint by using local farmer’s markets, two within walking distance of the indoor urban farm, and transporting produce to market by foot, using a wagon. Many local food businesses, such as urban farms for farmer’s markets, are challenged by production costs on the small scale. Common understanding of markets for fresh local produce includes farmer’s markets or other direct sale venues, CSAs, sale to local restaurants, and finally sale to grocery stores. Of these, CSAs tend to produce the lowest revenue and restaurant sales the highest. For single-product producers, such as a berry farm or a lettuce garden, the CSA model is not practical. In deciding to focus on farmer’s markets rather than restaurant sales, the Living Lettuce team considered one of the tenets of the B Corp model—the impact of the business on the community. The planners did not want to exclude members of the community who need to use SNAP benefits from access to fresh and healthy local produce. Both local farmer’s markets allow use of SNAP benefits. It may be that scaling up production for both venues will allow a healthier balance sheet, but that factor will not weigh more than the community need to access healthy and fresh, affordable food. The resurgence of cottage food laws in many states has opened the door to the very small, local food producer. While the economies of scale can still impact long-term growth for these small businesses, a network for local food systems provides structure, support, and most important, access to established markets. In many communities across America, a local food system support network may include management of community gardens, gardening education in schools, support for local farmer’s markets, community kitchens, support for local business development, and opportunities for networking. The development of urban farms, orchards, and apiaries in American cities should bring greater support and understanding of the challenges of producing food. Your (local food system support network) would love to work with you to develop your new food business, and we are always looking for volunteers and gardeners. Get in touch!